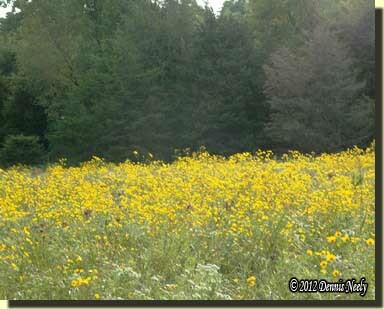 Petite yellow flowers blanketed the fen. Lavender colored milkweed blossoms dotted the swamp’s edges, and pale-yellow bumps tipped mullein stalks like fresh-kindled flames on a night hunter’s torch. As I sat beneath the spreading boughs of an old red cedar tree, a red-tailed hawk swooped to a lofty perch. It was late August, in the Year of our Lord, 1795. The hawk appeared older, fuller bodied with an abundance of ruffled feathers. It preened and fluffed and then, as if turning into a war bird, its feathers settled into the sleek look of armor. I watched a single, light-colored feather drift to the northeast in the calm morning air. I smelled the milkweed and what I supposed was the scent of the small yellow flowers. I felt the warmth of a rising sun on my skin. My forehead perspired. Sometime after the feather disappeared in the cedar boughs of the far bank, a long-legged spider crawled upon my hunt-stained buckskin leggins and made its way to the wedding bands of the Northwest gun’s barrel. For some reason, the little creature preferred the browned steel barrel to the varnished forestock. Time and again it zigzagged from side to side on the barrel, testing the feel of the wood, but it never choose to leave the barrel. I tipped the muzzle against a few blades of grass and the spider took the hint. When the hawk turned his back to me, I arose, slung the bedroll over my shoulder and slipped into the shadows. A dozen trees to the north of where I had rested, my elk moccasins plied a doe trail that wandered west, up and over a modest hill. Songbirds flitted about: sparrows, a cardinal, a yellow finch and a robin or two. None spoke. In the distance a fox squirrel chattered, and to my right a field mouse scurried through a gap between the dried oak leaves of last summer, disturbed a day or two earlier by scratching wild turkeys. In time, the morning’s course paused overlooking the nasty thicket. Down the hill, at the edge of the drought-dry thicket, a barkless oak stood. Two-thirds up the old tree’s trunk, a scraggly branch jutted straight out, and on that branch, calm and peaceful, a fox squirrel lay, looking right at me. It was thirty-some feet up and I knelt on the ground, yet we saw eye to eye. I chuckled. The squirrel’s front paws fidgeted, but it did not flee. I quietly retired to the sanctity of my 18th-century Eden. The Woods-N-Water News Outdoor Weekend is a few days away. A common question at the outdoor shows we attend is “Do you ever hunt with a modern gun or using modern clothes?” and the answer is always the same: “No.” I don’t own a full set of modern hunting clothes and haven’t for almost 30 years now. My father and mother’s shotguns are in the gun safe, along with the Lefever Nitro Special 12-gauge double I hunted with in high school, but they’re value is sentimental. As I explain at the shows, if you were to call and say, “Denny, come over tomorrow and let’s hunt pheasants, or turkeys, or squirrels, or whatever,” I’d show up with Old Turkey Feathers, the proper projectiles and fixings, and dressed in my 1790s clothing. From time to time, these statements draw a raised eyebrow or two, but the answer simply boils down to this is the hunting arm, clothing and accoutrements that I have the most confidence in. When I assist a modern hunter in the “conversion” to a traditional black powder hunting experience, the biggest obstacle is the confidence building: first, in the muzzleloading arm, second, in the accoutrements and loading process, and third, in the development of the personal hunting skills necessary to get close enough to effect a clean, humane shot. After all, we all want to achieve success, allowing that each person’s definition of success varies, and most often, “acceptable success” relies heavily on the taking of wild game. But one’s confidence in modern tackle also works against the newcomer to traditional hunting. The prospective convert’s dependency on a tree stand or “people box,” as my wife Tami calls them, a zeroed-in, scoped firearm, bow or crossbow and the latest camo clothing, slathered with chemical wonder scents, either undermine the learning process or hamper it. In addition, the “high-tech” nature of today’s hunting methodology creates a feeling among modern hunters that they no longer need to develop solid woodland hunting skills, and for many folks, improved “success” rates seem to support this hypothesis. Choosing to follow any given hunting philosophy, modern or traditional, is just that, a choice. For a hunter schooled in modern methodology, there is a definite learning curve to traditional hunting, for assembling the gear typical of a chosen era, for acquiring sufficient knowledge and for attaining a skill level that fosters a meaningful, history-based hunting scenario. But the steepness of the curve is dependent on the willingness of the student to embrace a different and exciting outdoor philosophy. Perhaps the greatest stumbling block is accepting the “limitations” traditional hunters place on each woodland scenario, at least, that is what many newcomers seem to get hung up on. In hindsight, I don’t give those limitations much thought anymore, and I don’t believe I ever did. When I first started down the traditional path, giving up modern trappings to engage in a hunt centered in 1795 appeared to be the only way to gain understanding into what it was like to hunt, live and survive in the Old Northwest Territory. The choice was mine, and the restrictions were a part of that choice. Hopefully, at some point along the trail, the joy, the exhilaration, the mystique of wanting to become one with history, if only for a few fleeting seconds, takes hold as it did for me. There is a certain aura that surrounds the old flintlock, the linen and wool, and the horn and shooting pouch. Wrapping myself in the trappings of the 18th century free my mind and allow my thoughts to wander back to my beloved 1790s. Whether sitting watching a red-tailed hawk or stalking to the next rise the historical atmosphere that I choose to create, that I choose to embrace, makes each second spent in the glade unforgettable. The taking of game is an added bonus. The real treasure is each precious second spent in another time, in another place. But there again, that’s the way I’ve chosen to hunt and how I define success. As I try to convey to show guests, I am searching for “pristine moments,” points in time when I can’t tell the difference between the 21st century and the 18th century, points in time where my feelings, emotions and impressions match those written in a long-forgotten woodsman’s journal. And glancing back at the last 35 years, I feel I have taken as many wild critters with Old Turkey Feathers as I would have with a modern shotgun, maybe a wee bit more because I have concentrated my efforts on one gun. It didn’t start out that good, but practice and experience remedied that circumstance. With a few exceptions, the tales that I chose to tell are not those of triumphing over a noble stag or a wary gobbler, but rather I choose to relate the epic of traversing the hills and valleys along the way. “I don’t know, maybe nine or ten?” I answered without thinking. The gentleman’s questions continued, as he shook his head, baffled that anyone would willingly choose to hunt in an 18th-century style all the time. After the fellow left, Tami tugged at my sleeve. “You’ve taken more turkeys than that since we’ve been married,” she said. “And look at all the ones you’ve got pictures of in the album, to say nothing of the early ones that you didn’t get pictures of, or the first birds you’ve helped everyone else with.” And she was right, but as a traditional woodsman that’s not how I define success. This entry was posted in General and tagged Dennis Neely, historical trekking, North West trade gun, Northwest trade gun, traditional black powder, traditional black powder hunting, traditional blackpowder, traditional blackpowder hunting. Bookmark the permalink. Dennis, I enjoyed the article very much even though I don’t always hunt in primitive clothing I have used only flintlocks for the last several years. 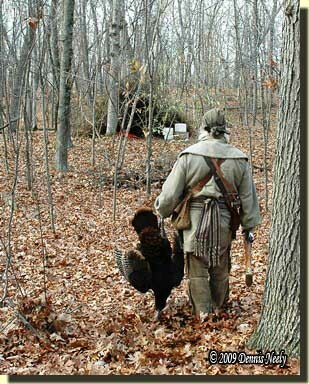 I’m still looking forward to my 1st flint turkey. Squirrels, deer and rabbits don’t seem to be a problem but I’ve yet to connect on anything with feathers. Just keep at it, and a nice gobbler will walk by when you least expect it. I really enjoyed the story. I love to hunt ruffed grouse and I tried it once with my 46 inch barreled trade gun. The gun just was not handy in the thick brush that the grouse calls home. I now have a shorter barreled flint shotgun that may work. The long barreled trade gun did get a turkey and a few rabbits. Great read! That might be the first story I’ve read that completely encompasses how I feel about hunting today. Thanks! Thanks for that little essay Dennis. I would second Adam’s comments noted above. I am more and more leaning towards you method of hunting.